Convener of the Voice Against Corruption, Wasantha Samarasinghe has accused incumbent President Maithripala Sirisena and Prime Minister Ranil Wickremesinghe of following former President Mahinda Rajapaksa’s nepotistic footsteps. Addressing a press conference, Samarasinghe, who is a JVP provincial councilor, said that the current administration was not brought to power so the same activities carried out by the previous administration can continue. “Just like Mahinda Rajapaksa took care of his brothers, today even Maithripala Sirisena is doing the same. His brother who is the Sri Lanka Telecom Chairman is receiving an allowance of Rs. 700,000 only for housing,” Samarasinghe said. He also claimed that the president’s brother had also awarded an insurance deal on behalf of Mobitel to a company owned by a known acquaintance which resulted in a Rs. 3 billion loss. Samarasinghe also highlighted that despite submitting necessary evidence against Central Bank Governor Arjuna Mahendran for his involvement with his son-in-law in the Treasury Bond scam, no action was taken. “But despite this, the bond business is continuing at the Central Bank. Even recently they issued 80,000 bonds, even though the tender was for 40,000 and this has been sold to a company which owned by the friend of Mahendran’s son-in-law,” Samarasinghe added. He noted that the people didn’t send the previous government home and elected a new President on January 8, 2015 so the new administration can continue to keep doing what the old administration did. “People didn’t give Sirisena the power for his brother, son-in-law and daughter to do business. People gave Sirisena a mandate, he should act accordingly. Action must be taken against the corrupt,” he added. The Fifty–Fifty Interlude: Communalism Or Nationalism? It is a tradition going back to early 1970s. As traditionalist Lankans MS and RW have continuing what was passed on to them. If you can’t win them join them. What was JVP doing when it was sharing a bed with MR and his clan? I forgot, they were with MR only because of the war. JVP was more focused on beating up the Demelas than concerned about how MR won the 2005 elections and what his clan stole from the coffers. What a bunch of hypocrites these moda Marxists are? Rw and MS promised many things to minoroties,to India,to the West and also to poor villagers.They won like yhat.People never wanted Ranil and that was the reason he lost 30 times.JVP fought a lot to bring down MR and it is true they wantef MR kill Terrorists and your word “demala”has nothing to do with that.Thanks to the elimination of your so called demalas today Tamil,Muslim children from north and east go to school and their older brothers and sisters frequent universities. I respect some JVPrs and their energies. But the man on the picture I believe just a rebel in civil suit. His rhretoric goes near to theorities only. Actually, if they compare the current regime with the previous one – they should now be suffering from a health problem. Believe or not much is done by current regime restoring more rights towardds the improvement of BASIC HUMAN RIGHTs. As a result of this, even President, most powerful person is being attacked by SOCIAL media today than had been in the past. Today the problems mainly lie on the journalists that are a greater portion of countrys media instutites, seem not reporting as things unbiased. They still seem to be not going away from the manner the yhad been trained by Rajakakshe media units. We perfectly know there are no such taming processes towards journalists by the current regime. Even if PM loudly attacked few hand picked journalists lately, he has not put his fingers to attack them yet. He loudly asked people shold be informed unbiased manner – journalists knowing their responsiblities well. Derana is singing housana pro Rajaapkshe even today. Their programmes keeing Chapa bandara or the like figures are to give a voice further to Rajapakshe. They dont care even if hundrends of billions may have been kept away from Rajakashes – they just think it is their duty to perform the manner they are upto. Derana though do some good work, but mostly, not a good sender that reveal the ground realities as they really are. JVPrs are simply not practical. They can loud on stages as no others, but people in general dont like them for one reasons, so picky …. beyond all practical way of life. As if they are perfectionists. JVPers please see yourself in mirror and then try to mobilise accordingly. You have a greater potential to give life this war torn crime friendly nation. Be real -not just bound to be books. Practical way of life is what you have to learn. Strenghthen your foreign ties affairs. Just being lanken graduates you cant achieve a lot. You need to have international relationships.. since we cant live being isolated on this planet. Learn as to why your former left you and now get close Buruwanse the most parasite but paranoid of the representative of social scum. He is right in saying that the administration of My3 and Ranil are as flawed and corrupt as the MR Mafia. But this is what politicians are in Sri Lanka. The uncle nephew party started it. From meagre pickings of lakhs of rupees at that time, by the time the MR mafia came into power the political elite fraudsters were counting their ill gained wealth in billions of US$. Most of the fraudsters of MR’s regime are now with the My3 government as Ministers and Deputy Ministers, having being appointed under the fraudulent National List scheme. So don’t expect yahapalanaya but simply accept the fact it is yamapalanaya through and through. I believe JVPrs should make MORE efforts to get close to the hearts of the average. Had this been done long ago, or achieved the levels, they would have been gotten more seats than 6 or 7 as it is now. Breaking the fences built around the folks following 89 insurgencies- THEY can be true law makers to the nation. Like our dog at my sisters, THAT WOULD BITE UNPREDICTABLY you never know JVP would rise as 89 like rebells or not… once facists, can not be recurrent their thoughts again, but the probablity is still high.. – is what reverberated in me being put to a long held harm to my mind being faced to to them in LATE 80ties. Their theories are okay, But when doing politics specially in coutnries such ours .. you need to allow people to decide. We cant make them understand by forces. JVPrs strategies are okay, but for politics, still nt ripe enough as I see it sofar. Just go on picking… as ones in classrooms did during schooling, you cant do politics. They have no seniors to rely on them today. Even somawansa was now close to the wrong doers rather than right doers. So where have they gone over there years ? They were all well trained by Mahinda Rajapaksa. Mahinda Rajapaksa told both of them, make hay while the Sun shines. The modayas, mootals and the sheep won’t know the difference. Sad, but that is what you are seeing. I admit that I haven’t read the article, just the Title. If I have to read the article, I’ll do so when I am convinced to do so by any comment that pops up. In Sri Lanka, nobody follows anybody’s footsteps, not even their own! No footstep is worth following! In our estimation, we need no leader; we are ourselves leaders. Yes, we are all Leaders. Naturally, there are no one left to follow us! If you ask me, Nepotism is not a bad trait. Even Cronyism is not bad. Don’t ask me what the difference between the two is. Not much. If there is any, it doesn’t matter in our case! ‘Voice Against Corruption’ has caught the wrong end of the problem. What then is the Problem? Hey, the answer to that doesn’t belong here; that should not appear as a comment under this article! Nathan’s comment is the symptom of an idiot posing as a genius. Not very convincing though. He is not alone. As a CT reader I kindly request those making comments to ‘comment’ only if they have some useful insight to impart; otherwise just stfu. Thanks but no thanks to everyone of those idiots including the c&p artists Amarasiri and Native Vedda. So it was you who brought this group to power? How did you manage that with your ‘one lakh’ of votes in the whole country? 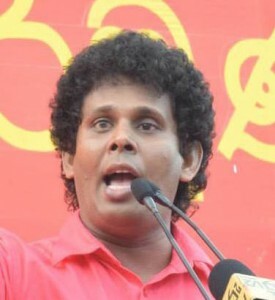 If you are so powerful, why not JVP field its own candidate and win a presidential election without “Mukku Gahanawa”. Absolutely ‘hits the nail on the head’ or ‘never a truer word was spoken’! Certainly looks like these guys have no shame in displaying their arrant hypocrisy! Questioning the master are you? Did anura who dissapeared into Ireland with no transparency give your the clearance to expose Ranils corruption? From the moment he appointed his brother….it was business as usual. When will we get leaders who will do the RIGHT THING FOR THE COUNTRY, before they fleece the country, and give their unqualified, greedy relatives, the power to rip us off? We seem to have a very low calibre of politicians, whose pockets are too deep, and their main intent is to fill their pockets, and ignore the rest of the country? The Mahendran appointment and bond swindle officially blessed by the PM, and the Kumarasinghe usurpation of the SLT Chair blessed with a wink and a nod by the President, are the glaring and highly symbolic manifestation of the Ra-Siri insincerity and commitment to follow the Medamulana get rich quick policies. They do not even have the excuse of political necessity, like in the case of appointment of MPs via National List, to justify the two appointments. Mahendran and Kumarasinghe, while having done nothing even close to laudable up to now, have actively engaged in the most outrageous and scandalous acts in their official capacity. The two appointments are doubly unacceptable and a repudiation of Yahapalanaya, in the context of the Mahendra-Kumarasinghe stench, so long as the Ra-Siri duo DO NOT ACT with sufficient conviction to haul in the mega fraudsters headed by Mahinda Rajapakse. When they claim that a hundred or more mega million frauds are being investigated for the last fifteen months, and there is not a single conviction, even a trial, up to now, people are justified and have the right to doubt their sincerity. The test is simple: why cannot the Ra-Siri duo find a simple financial crime, where Mahinda Rajapakse or any one of the family swindled the Government for even a paltry sum, which can be proved beyond reasonable doubt? Why cannot they file a criminal misappropriation case, concerning that particular crime, get a conviction and jail the convict? Sirisena and Ranil must know if Rajapakse or a sibling is jailed for a couple of years, that will bring forth a deluge of evidence to facilitate the successful conviction of the thieves for the more serious and heinous crimes. Wasantha Samarasinghe may be a young dreamer as depicted in some comments, but no one looking for honesty in Government can fault his claims.